Reginald James Murray was born in Wellington, New Zealand, on 27 April 1906 to Walter James Murray, a commercial traveller, and Nellie, née Miller. Walter Murray’s birthplace was Edinburgh; Nellie was born in Hobart. After Reginald’s birth, the family moved to Brisbane, Queensland, and later to Hobart, Tasmania, where Reg (as he came to be known) developed the ‘natural curiosity . . . of a boy who had been brought up in a seaport’. He later recalled the visit to Hobart in 1922 of Carl Anton Larsen and his Norwegian whaling fleet, en route for the Antarctic. Educated at Goulburn Street State School, Reg completed his intermediate certificate at Hobart High School. As a young man he worked in shipping—on the wharves, as a seaman, in shipping companies. He had had, he said, ‘to fight [his] way up from the forecastle’. He was well acquainted with vessels such as the Austral Lind, Austral Dale, Ferndale and Fordsdale and collected photographs of ‘hundreds of ships’. When World War II broke out in September 1939 Murray was in his early thirties and an employee of Australian National Airways. On 8 November he enlisted with the Australian Military Forces, having been a member of the Royal Australian Naval Reserve for seven years. In 1941 he was commissioned as a lieutenant, and in 1942 enlisted in the AIF, serving in the Australian Intelligence Corps and the 16th Australian Small Ships Company. 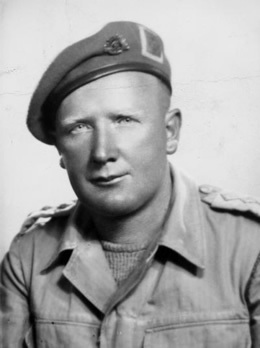 He was promoted to captain in 1943, having completed a certificate in military intelligence in Liverpool, England, in the same year. He went on to serve with landing craft and small ship units in Darwin and in New Guinea, where he commanded his own vessel. A military reference described him as ‘a good student’, ‘logical and methodical’ with a keen mind for detail—attributes which were later manifest in his Senate speeches. He was discharged on 16 January 1947. Murray was elected to the Senate in September 1946, alongside fellow Labor men, Bill Morrow and Justin O’Byrne. Morrow, a radical unionist and a controversial figure in Tasmanian Labor politics, had won preselection for the Senate in March 1946. As a result of his preselection, and the surrounding turbulence in Tasmanian Labor politics, the Australian Workers’ Union candidate, E. N. West, withdrew in protest. In August another member of the Tasmanian Labor team, M. S. McNeair, also withdrew (on the grounds that, if elected, he would be unable to take up his Senate post while holding his position as a government high school headmaster). Described as ‘a last-minute choice’, Murray, at this time almost certainly active in the Seamen’s Union and the Tasmanian branch of the Federated Clerks’ Union, was allocated first position on the ALP ticket. His campaign advertisement shows him in uniform with an accompanying caption: ‘A Young, Forceful Ex-serviceman solicits your help and support for the SENATE LABOR TEAM’. Murray topped the poll. His first speech in October 1947 emphasised his ‘pride and true humility’ in his election, and his wish to serve his political apprenticeship with ‘diligence’ and to make a ‘worthwhile contribution’. He referred to the rule of law, his respect for the Parliament, and to justice being the moral signification of law. He was concerned about the interests of ex-servicemen, and said that, as a comparatively young man who had travelled extensively, he hoped to bring common sense to any decision he had to make. Murray was well informed, his speeches drawing on research as well as experience. Much of the latter came about as a result of his travels throughout Australia, and to England, New Guinea and Japan during the war and the subsequent peace. He spoke at length on the Papua and New Guinea Bill 1949, which established a new system of joint administration for the two territories. Often anecdotal, the speech provided an assessment of the strategic and economic significance of the area. Supporting political representation of the indigenous people, Murray referred to the need for better telecommunications, health and education for those who had so assisted Australian servicemen during the war. He criticised the Labor Government for failing to ensure that valuable equipment was used for the benefit of the local people. Much, he said, had been ‘left to rot’ or appropriated by private entrepreneurs. ‘If the Minister’, Murray remarked, ‘is too busy to go to the territory’, members of the Parliament could go on his behalf as a select committee. The interests of Tasmania were always to the fore. Murray’s support of the Chifley Government’s Shipping Bill, which established a government line of ships and licensing provisions that would ensure a virtual monopoly of the coastal trade for Australian-built vessels, was unreserved. (He was also an advocate for ‘an Australian mercantile navy’ as ‘a second line of defence’.) He supported a central whaling authority and hoped ‘that in the near future the pelagic whaling industry in the Antarctic will be operated from Tasmania’. He provided the Senate with a potted history of the whaling industry in Australia, and affirmed that Australia ‘must go to the heart of the tremendous natural resources in the Antarctic’. Like others of the time, he saw the Snowy Mountains Hydro‑electric Power Bill as a milestone for Australia, pointing out that Tasmania had had a ‘flying start’ in hydro‑electricity. Murray was keen that an Australian voice be heard in the Pacific. In 1948 he was a member of a parliamentary delegation to Japan, which received controversial media comment. Murray admitted that the delegation had met the Emperor on its own terms, and refused to apologise for delegates who attended military functions in Tokyo in their shirt sleeves. He provided an interesting account of Japan under Allied occupation, including his impressions of a visit to Hiroshima on the third anniversary of the dropping of the atomic bomb. A great admirer of H. V. Evatt’s work on the foundation of the United Nations, Murray’s speech during the 1950 Address-in-Reply expressed the buoyancy of the time. He saw people all over the world as ‘looking to Australia as the great Pacific country’. He recognised the need to develop Australian ‘culture, medicine, art, drama and literature’, to teach civics in schools, and to improve the study of Australian politics in universities. Murray was a member of three significant parliamentary committees, including the Joint Committee on War Gratuity, chaired by the Prime Minister, J. B. Chifley. A supporter of the proposed Senate standing committee system, in 1950 he was a member of the Select Committee on National Service in the Defence Force, chaired by Senator McKenna and comprised entirely of Labor senators who claimed that the Government’s decision not to allow key public servants to give evidence constituted a breach of parliamentary privilege. On 14 March 1951 Murray was appointed to the Select Committee on the Commonwealth Bank Bill (again made up of Labor senators only), but his tenure of the committee was short, for the Menzies Government, frustrated by Labor’s Senate majority, seized the opportunity for a simultaneous dissolution by interpreting the referral to the committee as a second refusal to pass the legislation. When the country went to the polls on 28 April 1951, Murray lost his seat. He made three attempts to re-enter federal Parliament, all unsuccessful—in 1953 for the Senate, in 1955 for the seat of Braddon in the House of Representatives and yet again for the Senate in 1958. After his defeat Murray was private secretary to the Leader of the Opposition in the Senate, Nick McKenna, and became increasingly active in grass-roots Labor politics. In 1950 and 1956 he was a Tasmanian delegate on the Federal Executive of the ALP. From 1954 to 1962 he was treasurer of the Tasmanian Labor Party, and in 1959 attended the Australian Council of Trade Unions Congress in Hobart as minute secretary. In the same year he attended the International Labour Organization conference in Geneva in his capacity as president of the Tasmanian branch of the Federated Clerks’ Union. He was a delegate to the interstate ALP conferences of 1961 and 1962. He visited Russia and the United States, the latter as a result of a grant by the United States Department of Labour to study trade union organisation. Murray was also an associate of the Australian Institute of Management, a member of the Good Neighbour Council, the YMCA, the United Nations Association and the Mission to Seamen. A member of the Naval and Military Club and the Royal Yacht Club of Tasmania, his recreations were yachting and deep-sea fishing. As a young man he had played Australian Rules football for the Lefroy Football Club (1925–32), representing Tasmania between 1927 and 1929. On 30 March 1937 he had married, in the Melbourne suburb of East St Kilda, Edith Daphne Nash, née Stepto, a divorcee whose young son George later took his stepfather’s surname. The marriage was conducted according to the rites of the Presbyterian Church. Murray died on 25 November 1962, survived by his wife and stepson. At the funeral service, held at St Mary’s Anglican Church, Moonah, on 28 November, the Premier of Tasmania, Eric Reece, described Murray as one of Tasmanian Labor’s ‘most efficient and dedicated administrators . . . a loyal and earnest worker for Labor interests’. CPD, 6 July 1949, p. 2015, 15 Mar. 1950, p. 750, 10 Feb. 1949, p. 123; Murray, R. J.—War Service Record, B883, NAA. Ross McMullin, The Light on the Hill: The Australian Labor Party 1891–1991, OUP, Melbourne, 1991, p. 237; Richard Davis, Eighty Years’ Labor: The ALP in Tasmania, 1903-1983, Sassafras Books and University of Tasmania, Hobart, 1983, pp. 39–43; Mercury (Hob. ), 20 Aug. 1946, p. 4, 30 Sept. 1946, pp. 2, 11, 17 Sept. 1946, p. 3. CPD, 16 Oct. 1947, pp. 851–4, 9 Mar. 1949, pp. 1113–22. CPD, 10 Feb. 1949, pp. 119–27, 10 Mar. 1949, p. 1239, 6 July 1949, pp. 2015–19, 30 June 1949, pp. 1768–72. CPD, 9 Sept. 1948, pp. 309–17, 15 Mar. 1950, pp. 746–51. CPP, Joint Committee on War Gratuity, report on the War Gratuity Act, 1948; CPD, 15 Mar. 1950, pp. 757–8, 15 Mar. 1951, p. 550; CPP, Select Committee on National Service in the Defence Force, reports, 1951; Senate, Journals, 14 Mar. 1951; G. S. Reid and Martyn Forrest, Australia’s Commonwealth Parliament 1901–1988, MUP, Carlton, Vic., 1989, pp. 214–15. Mercury (Hobart), 26 Nov. 1962, p. 2; Patrick Weller and Beverley Lloyd (eds), Federal Executive Minutes 1915–1955, MUP, Carlton, Vic., 1978, pp. 438, 466; Australian Delegation to ILO Meetings, Geneva, 1959, A463/59/4420, NAA; Davis, Eighty Years’ Labor, pp. 125–6; Mercury (Hob. ), 28 Nov. 1962, p. 25, 27 Nov. 1962, p. 3; The editor is indebted to Michael O’Sullivan, Australian Services Union, Melbourne, for information on the Federated Clerks’ Union, to Alf Upton of the Tasmanian Football League, and to Murray’s stepson, Mr G. R. Murray, for confirmation of details in this entry. This biography was first published in The Biographical Dictionary of the Australian Senate, vol. 2, 1929-1962, Melbourne University Press, Carlton, Vic., 2004, pp. 217-220.